Over 340 students attend Shree Patle Higher Secondary School which has 15 classrooms and an office and educates children from playgroup up to year 10. NAFA first assisted this school in 2009 with tin roofing to help them complete a new 3 classroom block. In 2010 they received funds for three school toilets and a water tap and in 2014 NAFA assisted in the construction of 4 new classrooms. In the second earthquake in 2015 the one double story building was destroyed and the 4 classroom block sustained damage. Both required rebuilding, totalling 8 classrooms. The other existing classrooms required repair for minor damage and some retro-fitting to meet the new government guidelines. NAFA committed to help this school with their rebuilding and repairs. 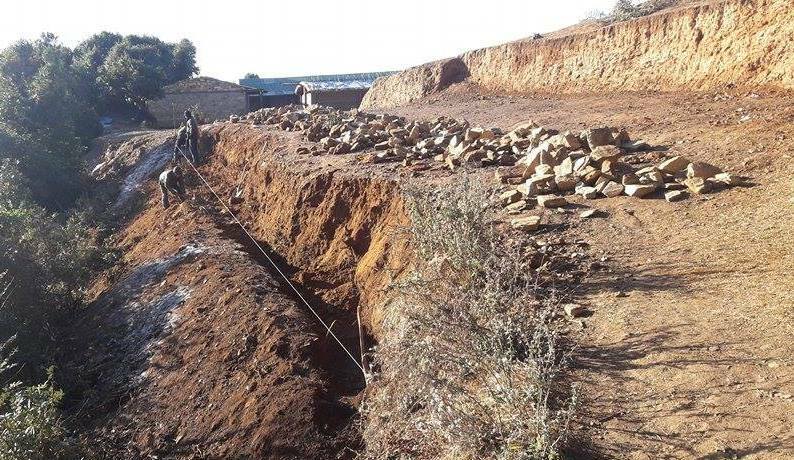 The school committee hired local builders and labourers to clear the site of debris to make it ready to commence construction once plans were approved. They also constructed temporary classrooms for the students from materials they salvaged from the destroyed classrooms such as wood and tin roofing. These temporary classrooms had dirt floors and were very inadequate as this village is very cold in winter. A fresh site measuring 30 metres x 10 metres had to be cleared for one of the new four classroom blocks. The community worked together volunteering their time to clear the land, it took 350 ‘man days’ to do this work. 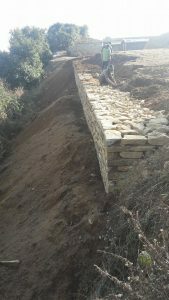 The school is on a very steep hill so, to secure the freshly levelled site, they also have to construct a retaining wall measuring 30 meter long built in stone. After attending an earthquake resistant training course on new methods of construction the local builders began work on the foundations of the first 4 classrooms which was overseen by a local engineer, Surendra Budhatoki, engaged by NAFA. 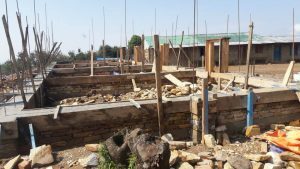 He oversaw the construction from the marking out of the foundations, through the different stages of building and finally when the roof truss was completed. Apart from the regular visits from the engineer, NAFA representatives visited the site in November and December 2016 and again in January 2017. The engineer and the school committee provided NAFA with regular reports and photos on the progress of the building. 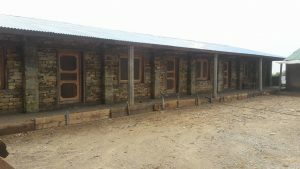 Nine months after starting work the 4 classrooms were completed in September after many delays due to snow conditions at the beginning for the year and heavy rains during the recent monsoon. 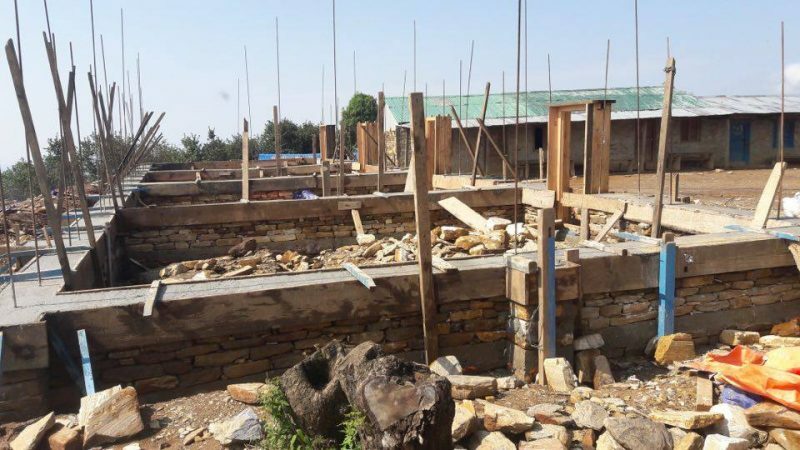 NAFA recognises the hard work the builders and school committee have done working though these difficult conditions to complete the first stage of building. They expect the second block of four classrooms to be complete by January 2018. NAFA would like to thank the Waller family for raising $81,236 though Auto and General to fund the construction of 8 classrooms and the repair of 7 classrooms.